A month ago, a Tamilnadu state Government bus made it to the headlines in Kerala, when a woman who was sitting inside the bus fell on the road through the bottom of the bus. Luckily she escaped from being run over by the bus. 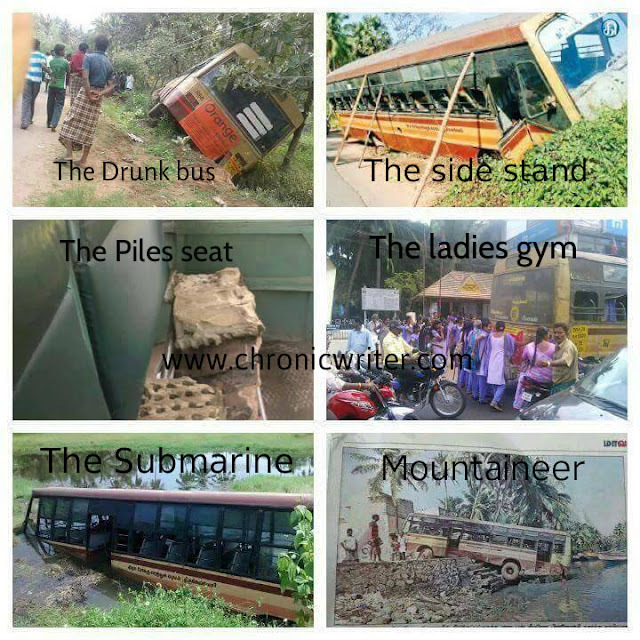 Critics claim that the condition of the Tamilnadu government buses are pathetic. But Chronicwriter and his team did a top secret survey on the buses and came up with an amazing discovery. The buses are in good condition. 1) Drunk bus: If you travel in this bus, it will give you the same feeling that only a drunkard experiences. If you do not have enough money to buy alcohol and drink, all you have to do is travel in this bus. You will have feel giddy. 3) The Piles seat: This is a CSR activity by the government. It is specially designed for those who have piles. If you don't have piles, if you sit on it, you will get piles. If you already have piles, eat pilex. That is what my friend Robert eats. 6) Mountaineer: You want to become a mountaineer? 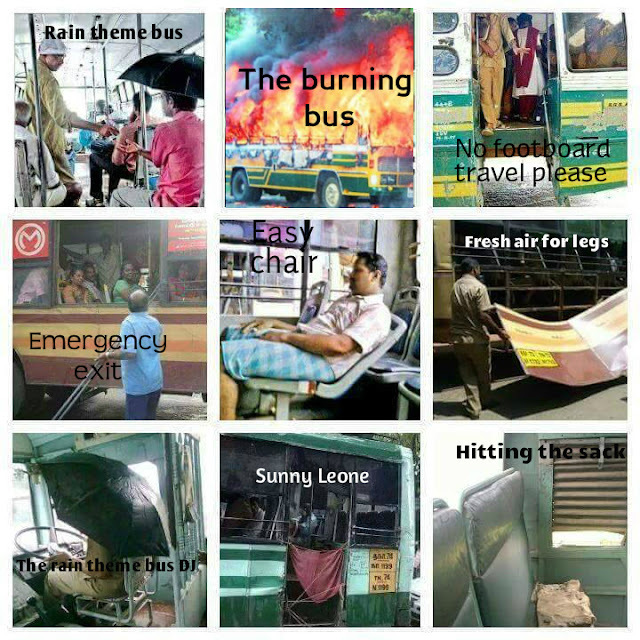 Just travel in our buses. You can even conquer the everest easily. If you think that the Government has only the above 6 varieties of buses, you are in for a big surprise because there are many more types of theme buses that the Government has released. 9 of them are displayed in the below picture. 1) Rain theme bus : If we rain theme hotels and discothes, why not a rain theme bus? 6) Fresh air for legs : Why should your face alone get fresh air? Your legs are also a part of the body and they need fresh air too. 9) Hitting the sack : The sack seat helps you to understand the poverty in our Nation. Nice..You have clearly about Tamil Nadu bus..Its very bad to know about the bus situation..Keep on sharing like this..
I’m experiencing some small security issues with my latest blog, and I’d like to find something safer. Do you have any suggestions? "Devops Training in Chennai"